Our last day in Siem Reap was rewarded with one of the best nights sleep I’ve had in months. Katherine woke equally refreshed. The laughter at the circus last night clearly did us a lot of good. So, we started the day slowly with crackers, bread and trying very hard to finish the massive pot of pineapple jam. It even called for a second cup of fruit tea. Very civilised, very boring. There was a small bit of packing up and getting organised for tomorrow and several emails back and forth to ‘The Escape Break’. They were supposed to collect us around midday and with traffic being a nightmare due to the holiday they didn’t have their usual tuk tuk driver. They couldn’t find us, the tuk tuk organised through our hotel didn’t know where the shopping centre was. It was a yo-yo few hours of coming in and out of the room wondering if we were ever going to get there. We could have walked it and just asked for the fare to be deducted from our costs. But, we got there and started to get excited about playing some more escape rooms. Two Indian friends wanted to start with the Prison Break so we started with the Detectives Room. You’re allowed 5 hints (over the walkie talkie) and you should manage to escape in 60mins. To cut to the chase, we didn’t escape. We didn’t even get close. We had exhausted ourselves and the hints and managed to finally be talked out of the room at 1hr 40. I won’t spoil the room by describing the clues and set up, but it is fair to say the clues were ambiguous, tentative and downright preposterous. We knew we had to find something on page 258. Several books didn’t have that page number, but were part of a diary entry, so we thought the clue was the missing date. The letter described counting out 25words, but again in what book? No correlation. And the safe that had an 8 number code only required 5 numbers to open it – absolutely frustrating! Still, we were out and about enjoying ourselves. It transpires that the two lads had given up on Prison Break after 20mins and wanted to play Lost Room of Temples. They were giving up on their second room much the same time as we had finished ours. This didn’t bode well for us as we had planned to do two more rooms. Plus, the electronics for Prison Break were now broken so we were left with only one choice. So, once they had reset all the clues we made our way up the stairs to the hardest room. Again, without spoiling the game for others, (or giving away clues to what we might set up in the apartment in the future) we had a blast. Manageable clues, with a pattern and flow to the system. We got stuck twice in the room. A map wheel that we had out by one increment meant we couldn’t undo a lock and a set of boxes with numbers on them correlated to another lock, but we had several in front of us and got confused. All in all, we escaped to the sound of ‘Who Let The Dogs Out’, with strobe lighting and a pot of treasure in our hands. The tuk tuk finally managed to navigate the busy streets of Siem Reap and return us to our hotel. I think he was glad that we told him when and where to stop. We’ve clearly picked the most obscure secret residence in the city. We made some dinner reservations in Mie Cafe for 20:00 and chilled out for an hour. Meeting up with Hoai for the final time, we had some exquisite food. The chef came from an impoverished background, trained in an NGO kitchen and now runs his own restaurant that serves amazing food and you need to make a booking – good on him. 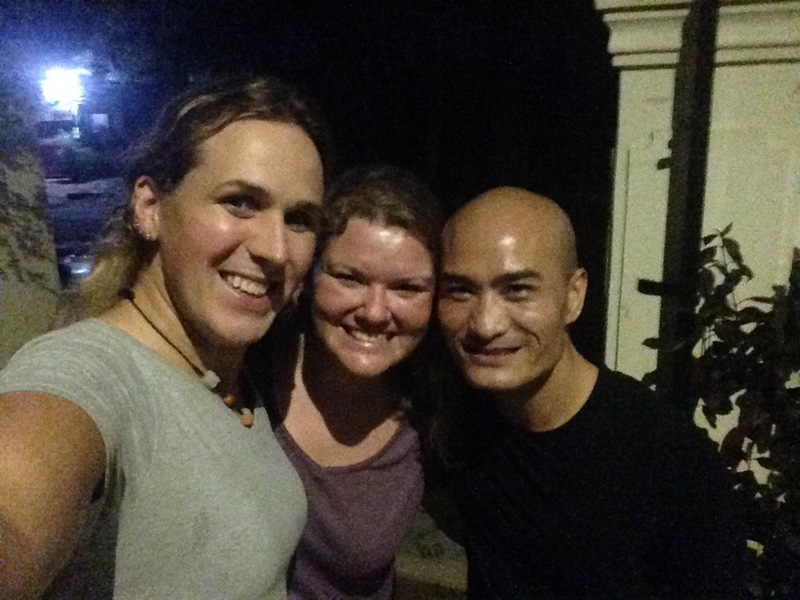 There was a cringe-worthy moment when leaving, Hoai, while chatting to us, stepped in to the pond moat around the dining area. Soaked up to the thigh on the left leg, he shrugged off the matter as we chatted some more and said goodbye. Our trip to Siem Reap has come to an end. Hopefully it won’t be long before I get to visit Vietnam, certainly it shouldn’t be another seven years before Katherine and Hoai catch up.